Libyan leader Muammar Gaddafi’s camp has vowed to push on with its war against rebels whether or not NATO stops its bombing campaign, leaving little room for diplomacy to end the five-month conflict. The rebels and their Western backers kept up the pressure on the veteran leader as the Muslim holy month of Ramadan began, with NATO bombing military targets and dropping leaflets over the capital calling on loyalists to give up. The rebels, who have seized about half the country but frequently lose ground to counter-attacks by better armed and trained Gaddafi forces and remain dogged by their own internal divisions, consolidated gains around Zlitan, a key town 160 km (100 miles) east of Tripoli. A war that some thought might be over in weeks once NATO forces, backed by a United Nations mandate to protect civilians, started to bomb Gaddafi’s military installations in March is instead dragging on into the hot summer and a month of fasting. “No one should think that after all the sacrifices we have made, and the martyrdom of our sons, brothers and friends, we will stop fighting. Forget it,” state television showed Saif al-Islam, the leader’s son, saying to families displaced from the eastern rebel stronghold of Benghazi. “Regardless of whether NATO leaves or not, the fighting will continue until all of Libya is liberated,” he added, in comments that were made on Sunday but broadcast on Monday evening. 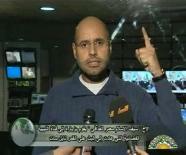 Saif al-Islam has not been seen speaking in public for several weeks. A United Nations peace envoy was dispatched to Libya last week and Gaddafi’s government had previously said that it would only start talks if NATO stopped its bombing raids. However, after talks with both sides, the envoy Abdel Elah al-Khatib left without making any visible progress and the world body said the two camps were far apart. Gaddafi may also sense an opportunity to exploit divisions caused by the slaying last week of the top rebel military commander in as yet unexplained circumstances. The rebels control most of the east of the country and have launched an offensive in the Western Mountains, near Tunisia. From Misrata –Libya’s third largest city some 210 km (130 miles) east of the capital which the rebels clung onto after weeks of street-to-street fighting — they hope to march west. “Fasting has only increased our determination and resolve to defeat the brigades of the tyrant (Gaddafi) to liberate Zlitan entirely, God willing, and make our way to our capital Tripoli, God willing,” said frontline rebel commander Husam Hussein. Hussein and his men were preparing late on Monday to break the first day of fasting after consolidating gains made in recent days on the eastern outskirts of Zlitan. At a rebel base nearby, off-duty fighters prepared meals of small pizzas and pastries as milk and juice were cooled in crushed ice before being sent to the front, where sporadic gunfire could be heard late on Monday. NATO said it had hit about a dozen targets, including ammunition dumps and missile systems on Monday. Despite fears that slow rebel progress on the ground and mounting bills for bombing raids will curb enthusiasm in Western capitals, Britain and France, leading members of NATO, have pledged that they will continue for as long as needed. Some 30 nations have recognised the Benghazi-based rebel rebel government and France on Monday announced it would place $259 million in unfrozen Libyan assets at the disposal of the Transitional National Council (TNC). But others are concerned that in recognising and backing the rebels with airstrikes on Gaddafi forces, NATO has overstepped its U.N. mandate to protect civilians. Venezuela’s President Hugo Chavez gave the Libyan leader, who is wanted by the International Criminal Court on charges of crimes against humanity in attacks on civilians, some rare international support. “Long live Muammar Gaddafi,” he said in a televised address. The rebels and their Western backers suffered a severe blow last week when General Abdel Fattah Younes, a former Gaddafi security minister who defected to theBenghaziside, was assassinated. The murky circumstances of Younes’s killing, which took place after he was summoned back from the front by his superiors, have prompted speculation of conspiracies and concern over the rebels’ ability to control areas they have seized. “Unfortunately, the Transitional National Council is acting very negatively with this case until now,” said Muatsem Abdel Fattah Younes, the slain rebel’s son, adding that the family may be forced to turn for international help to establish the truth.